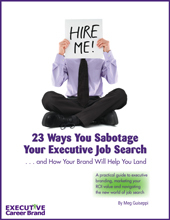 In executive job search, you need to build and safeguard your online personal brand and online reputation. 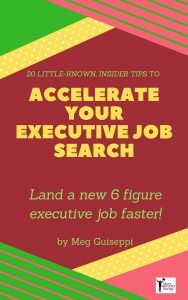 Hopefully, you know that executive recruiters and hiring decision makers at your target companies are Googling your name, once they’ve put you on their list of potential good-fit candidates. Your search results can be the deciding factor in whether they reach out to you, or cross you off their lists. If you don’t self-Google, you’ll never know what they’re finding. What if there is someone with your name involved in nefarious deeds, and people assessing you think you are that person? You’ll be out of the running without even knowing it. It may well be that you can land a job without having an online footprint, but those opportunities become more and more rare, as the digital age continues to invade nearly every aspect of our lives. Face it, just to keep pace with your competitors, you need to get with it, and take control of your online reputation. Take a look at your online footprint right now. Type your name into a Google search, and see what you find. What are recruiters and employers looking for when they Google candidates? 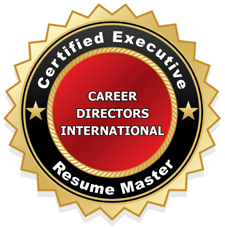 If they know you, or you’ve already sent them your resume, they want to see evidence online backing up the claims you’ve made in your resume and elsewhere. They know that people are more likely to tell the truth in the content they post online, than in documents they send to select people. Is your social media presence non-existent, barely active, moderately active, or super-active? 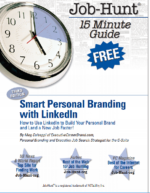 At the very least, you need to have a fully-populated LinkedIn profile. And you should consider having at least some kind of presence elsewhere – Twitter, Google+, Facebook, etc. The vast majority of executive recruiters use social recruiting (social networks and social media) to source and assess talent. They’re actively looking for people like you there. If you’re not there, they’re going to wonder whether you’re social media savvy and know how to operate in the digital world. Studies have shown that people relate to content better when it’s associated with a photo of the author. Make sure you have a professional-looking, close-up headshot that is not looking away from the content. If hiring decision makers are innundated with an overload of candidates, they’ll set the bar higher to whittle down the candidate pool. 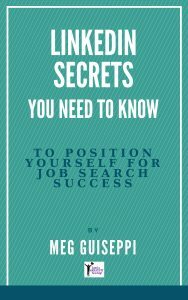 Unfortunately, that can mean that some great-fit candidates will be ruled out if they find “digital dirt”, and never given the chance to dispute the negative search results, if they’re untrue. Will people find these critical elements in your search results – relevance, quality, diversity, volume, consistency? Striving to meet these elements will increase the number of search results for your name. The better your online reputation, the better you position yourself online. The stronger your presence online, the more appealing you’ll be to the people who can most help you meet your career goals. So, you see, you must be diligent in building and safeguarding your online reputation. Get into the habit of self-Googling about once a week. If negative search results for your name appear, do whatever you can to have them taken down. 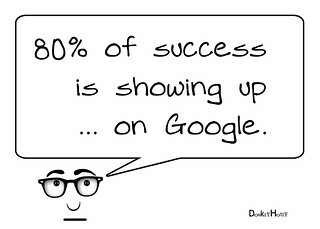 If that’s not possible, work hard at building up positive, brand-reinforcing search results, to supplant the bad ones. Google personalizes results based on your search history, so it’s a good idea, from time to time, to use someone else’s computer to self-Google. You may see different results. Also, it’s best to be logged out of any Google accounts (Google+, Gmail, etc.). Great points, but here’s the thing: This does not mention that Google shows you the results it thinks you want to see – not necessarily what a recruiter might see…. Should it also tell you how to delete cookies and go into incognito mode and/or use an anonymous browser most of the time so your Google results more closely mirror what a recruiter will see? Thanks for commenting, Mike. You make a good point. But it still makes sense to monitor your online presence for digital dirt. If you can see it, hiring professionals can see it too. I agree that self Googling is important; I read recently that 40% of companies will check out potential candidates online before offering a role, so the impression they see of you needs to be professional. Having your own social networking accounts (Twitter, LinkedIn etc.) plus your own blog can be helpful tools for not only demonstrating your experience but also to “owning” the front page of Google for your name so that you control your online reputation. Darren, thanks for commenting! It really is all about monitoring and taking control of your online presence, as much as possible. More and more people judge us by what they find, or don’t find, about us online. Alex, thanks so much for your kind comment. You’ve made my day!